Does your website pass or fail mobile friendly tests from Google and Bing? Here are links to the mobile-friendly tools supplied by Google and Bing. Note that they test a single web page, not the entire website. There are many other excellent tools to use as well, but this is a good place to start. 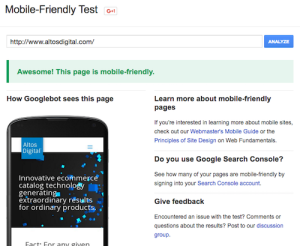 An example of the Mobile Friendly test on Google. 1. Text too small to read. With mobile usage surpassing desktop usage in 2015, more people are reading on their mobile devices. The font on your website should be no smaller than 12 pt font, but 14 pt font is preferred. When designing your site, imagine stubby fingers pressing links on a mobile device. If your links are too close together, then users can unintentionally press the wrong link which leads them down a path of leaving your site out of frustration. Keep adequate spacing between your links and users will appreciate the clean look and easy navigation. The viewport specifies how a webpage is viewed on a mobile device. According to Google, mobile optimized web pages should have a meta viewport in the head of each page.